As a double board certified facial plastic and reconstructive surgeon, Dr. Bassichis devotes his expertise to patients with skin cancer of the face. 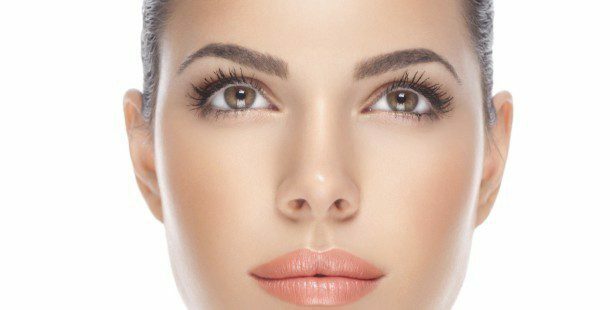 The devastating facial issues as a result of this serious yet common problem require the highest level of reconstructive plastic surgery skill. It is a privilege for Dr. Bassichis to care for his patients with Skin Cancer Reconstruction to facilitate his patients to resume a normal healthy life after skin cancer. As skin cancer one is the most common form of cancer, more and more patients each year develop skin cancers on their face. Skin cancer reconstruction is plastic surgery that repairs the face after cancer. After the removal of tumors or cancerous cells, repairs can include reshaping the eye, nose, ear, cheek, scalp or lip areas. Lesions in these sensitive facial locations are best treated by a team approach, which starts with removal of the cancer by a skilled Dermatologic MOHS cancer specialist. After the cancer is completely excised, the resultant defect requires reconstruction to restore a natural appearance. Skin cancer reconstruction is an effective way of disguising scars and repairing the damage after skin cancer removal and allows patients to feel confidant about their appearance after cancer. As a Facial Plastic and Reconstructive Surgeon, Dr. Bassichis’ performs Skin Cancer Reconstruction to repair the wound after skin cancer removal, so it can heal with an optimal aesthetic and functional result. Facial reconstruction following skin cancer allows patients to resume normal social interactions without feeling self-conscious about their face. Because each area of the face presents challenging and unique anatomy, facial reconstructive surgery demands a skilled specialist to preserve functionality and optimize the cosmetic outcome. 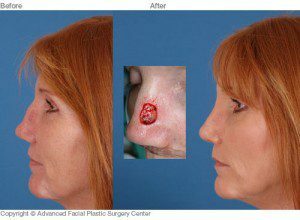 When functional structures like the nose, mouth, eyes, or ears are destroyed by skin cancer, it is a marriage of form and function to repair the wound and achieve a healthy natural outcome. Specializing exclusively in Facial Plastic and Reconstructive Surgery, Dr. Bassichis is dedicated to providing customized care to his facial reconstruction patients. As skin cancer reconstruction is a highly individualized process, Dr. Bassichis personally meets with all his facial reconstructive patients prior to their MOHS Surgery. During your initial consultation with Dr. Bassichis, your plastic surgeon will carefully assess your health and discuss options for your reconstruction. At this office visit, patients can view numerous photographs of Dr. Bassichis’ previous reconstructive surgeries. All of your questions regarding Facial Reconstructive Surgery will be answered and the surgery date is scheduled. With all Facial surgery, good health and realistic expectations are prerequisites. Dr. Bassichis stresses the importance of restoring natural facial contours and uses carefully planned incisions to accomplish this goal. Skin type, history of smoking, and age are important elements that factor into your final result. If you have a history of heart disease, high blood pressure, bleeding disorder, diabetes, thyroid disease or any other medical conditions, please inform Dr. Bassichis or a member of his medical staff. The first phase of your surgery occurs with your Dermatologist or MOHS surgeon. During this procedure you will be given local anesthetic while the skin cancer is carefully removed. After the margins are clear and the cancer surgery is finished, a bandage will be placed over the area where the cancer was. The second phase involves the reconstruction, which Dr. Bassichis performs at an outpatient surgical facility or hospital. Dr. Bassichis will remove the bandage placed by the MOHS surgeon and assess the defect from the skin cancer removal. After evaluating the defect, Dr Bassichis will determine the most appropriate reconstruction option to achieve optimal functional and cosmetic results for you. A board-certified physician Anesthesiologist will ensure you are comfortable and safe during the reconstruction. With Dr. Bassichis’ expertise in facial reconstruction, he will utilize advanced surgical techniques to provide the most natural outcome after your MOHS surgery. Post-operative wound care is as important as the surgery itself to ensuring the best cosmetic outcome of your Facial Reconstruction. Please follow all directions for wound care carefully. One week following surgery, your sutures will be removed. Two to three weeks post-operatively, the incision will be examined to ensure it is healing properly. At approximately the sixth post-operative week, further procedures to refine the appearance of your incision may be indicated. Dermabrasion is a specialized technique that can help camouflage the texture of surgical scars. Additionally, incisions with persistent redness can be treated with laser therapy to minimize their appearance and vascularity. The staff at the Advanced Facial Plastic Surgery Center are devoted to caring for our Facial Reconstruction patients throughout their entire surgical and post-surgical process. Dr. Bassichis’ special interest in facial reconstruction evokes comfort and confidence in his patients, as well as excellent results. We look forward to caring for you for your skin cancer reconstruction.